Knowing the correct paper roll size is the first step to start your paper roll business. If you know the model of your receipt printer, you can simply Google about the receipt printer model or ask your paper supplier, you can usually get exactly what products (paper rolls, printer ribbons, cleaning supplies, etc) are compatible. If you don’t have immediate access to that information – here is a helpful guide to show you what to measure and how to measure it. The width of the thermal paper roll is the first number in the specification. It is the most important measurement because if this is wrong, the paper simply won’t fit into the terminal. Using a ruler, measure across the face of the roll from side to side, then you can get the roll width data. If you are taking the measurement directly from a printed receipt, it is incorrect you measure the slip of paper from left to right in the direction of the text printed on it, you must measure from edge to edge straight across. Remember to be as accurate as possible in mm as small discrepancies in size can be vital when purchasing till rolls! In the United States, thermal paper roll widths are expressed in inches. Popular paper roll widths include 2 1/4, 3 1/8 inches. Generally, almost all credit card terminals take a 57mm wide roll, and the receipt printers take an 80mm roll. To measure the diameter, you must measure from edge to edge of the till roll going directly through the center spindle hole in the roll (The Core). the best way to do this is to put the roll down on a flat surface, with the flat side of the roll on the table so that it cannot roll. this way you can be sure you are measuring the correct side of the roll. The diameter of till rolls can vary from anything as small as 20mm to over 250mm. The bigger your diameter, the more paper that is on the roll. when measuring the diameter of your roll, it is important to never purchase a roll with a diameter bigger than the recommended size by us. This is as the roll may not fit in the machine. It means what’s the length/amount of the paper are wound on the roll. In general, the longer paper means you are purchasing more paper there will be in the receipt printer. It is not a must-know measurement when you order the paper rolls, but the longer paper means it can be used longer time in the receipt printer and you don’t need to replace the paper rolls so frequently. 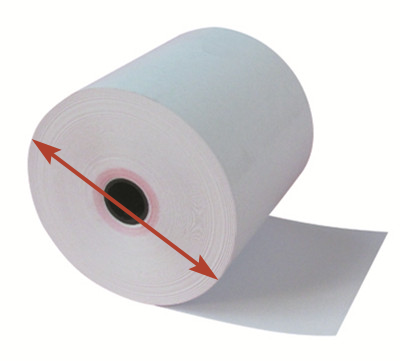 Take an example, for 80mm x 80mm thermal paper roll, its length can vary from 55m to 83m. If you want to know how to get the length of a paper roll, read this useful article for more information. In the United States, the length of the thermal roll is expressed in feet. Thermal papers are commonly sold in lengths of 75, 150, 220 and 230 feet, so you don’t have to stop to reload the paper during a job in which you are printing the receipts for your customers. 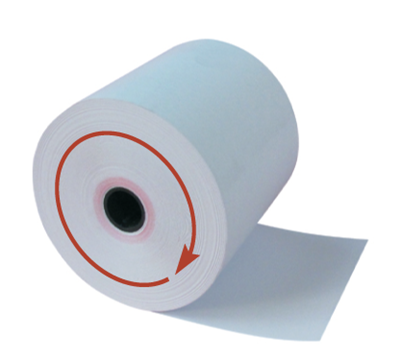 The core size refers to the diameter of the tube on which the thermal paper is rolled. Core I.D. (Inside Diameter) – The size of the center hole in the core. It is important because certain machines use a type of pin holder or spindle to support the roll and the core ID must match the size of these pins or spindle to function properly. The general core I.D. is 12.7mm (7/16″). Core O.D. (Outside Diameter) – The size of the entire core, hole and all. It is of less importance than the core I.D. but plays a role in the diameter/footage of the roll. This measurement is still used by some paper suppliers but unless your terminal still has a spindle that goes right through the roll, you won’t need to worry about the core diameter. Coreless till rolls with no tube to dispose of are also available nowadays. There are a few exceptions, but most terminals will take some standard paper sizes, as listed below. If you do not have a clue about the paper roll product, having these measurements will help you know what you need in order to determine the product best suited to match your needed POS Paper product. If you do find that you need a non-standard paper roll size, just get in touch with us via email: support@pandapaperroll.com and we’ll sort it out for you.